Whether you need to reduce noise to guarantee workers’ safety, gain the support of nearby residents and businesses, protect other equipment or a process, comply with regulations, or get recognition as a sustainable business, Boldrocchi’s industrial noise protection experts can find solutions that will surpass your abatement objectives. Our team has decades of experience in determining noise sources, measuring and analyzing the issues and finding a technical solution that will achieve all targets. Noise protection / silencers for transformers, generators, motors, fans, furnaces, transport systems, exhaust ducts, and all other sound sources large or small. Precise & detailed, for noise sources. Of sound pressure levels using measuring points. 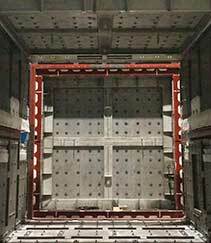 Ranging from acoustic insulators, absorbing silencers, auxiliary booths, etc. At measuring points to ensure objectives have been met. In 2016, Boldrocchi was awarded a contract to supply eight (8) diverter damper systems for six gas turbines, to be installed at a refinery in Lekki, Nigeria. The goals: achieve reduced wear & extended operational life. Thanks to our large in-house facilities, all 8 were assembled at once. They were then tested in-house in the presence of the customer’s inspectors. Turnaround was very short – at least for the first two – and Boldrocchi delivered within a mere 4 months. Boldrocchi helped close an existing open cycle circuit on a GE turbine in Amal. 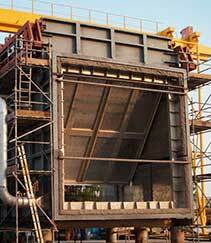 We designed four various dampers and diverters and had them made on-site, constantly supervising fabrication. Installation of the diverter, also supervised by Boldrocchi, was a significant challenge: the diverter measuring 5.2 x 5.2 m (17’ x 17’) had to be fit into the existing circuit with a mere 20 cm (8”) clearance! 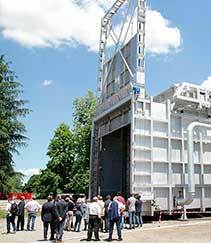 Boldrocchi welcomed over 30 customers from some of the largest OEMs to its in-house testing facilities near Milan, Italy in 2018, for the functional testing of an enormous 7m X 7m (23’ X 23’) diverter damper. The gas turbine diverter, one of three delivered to the client, not only offers extreme capacity, but surpasses the norm in terms of geometrical sealing, sealing pressure and closing time, while reducing maintenance and easing transportation and assembly.